On my former blog, Handmade Chic, I tried to talk a lot about how artists need to value themselves more--at least more than the imports we find ourselves competing with. I often found that talking about pricing is a very sensitive, and sadly, decisive issue. It shouldn't be. I should be about sound business practices. So I decided to recycle an article I wrote two years ago, back in 2009. I liked it's message then, and I think it's still true. Pricing your art. Ugh. It's enough to make most independent artisans start to sweat and second guess themselves...how to I price my creation so that it will be bought by my customers, but still help put food on my table? And how do I price my work objectively, especially since a little piece of me has gone into making it? I think the major issue I see with pricing is that a lot of artisans undervalue their work completely. It is easy to take the cost of materials, and know that you have to cover that, but far too many only take those hard costs into consideration when pricing their items. As a result, you begin to see a lot of nice items that are priced far lower than they should be. What artisans need to also figure into their pricing structure is their precious time...and not always just the time of physically making the item. I may make a necklace in an hour, but it may have taken two to three hours of planning and experimenting before actually being able to make the finished product. In a business reality, I need to realize that necklace takes me three hours to complete, and I need to pay myself for those three hours somehow. I feel that this is what separates a lot of successful artisans (i.e., they can make a good living at their craft) from the rest of people who find themselves thinking, well at least I can make back my cost of materials, but will never be able to be a self-supporting artisan. I myself have struggled with pricing my time for years. I personally now use a pricing calculator I purchased from Eni Oken, a well-respected jewelry artist. I realized that to support myself, I need to make about $20 hour before everything is taken out; taxes and social security need to come out of this amount, just as if I were at a salaried job. Once I accepted this fact, I also realized I needed to build the cost of non-materials such as Internet cost, computer costs, printer ink, etc. The only real variable in my pricing structure is now the cost of materials...if I want to make a piece that is more economical, I use less expensive materials, I don't cheat myself of income. I'll admit that I had sticker shock the first time the calculator told me what I should be charging. It was hard to admit to myself that I was worth that much as an artist. But if I don't believe that I am worth the price, how will my customers ever believe that? I want them to know that I believe enough in my work that I am not willing to undercut myself or my art. So what do you think about the pricing challenge? Do you feel you charge what you are worth? Was it easy for you to do, or did you struggle to get to that place? Does it bother you to see other artisans "undercharging", or do you maintain that what others do has no effect on your own business? Do you think you're being true to yourself when you do pricing, or is it something you still struggle with? Let us know! 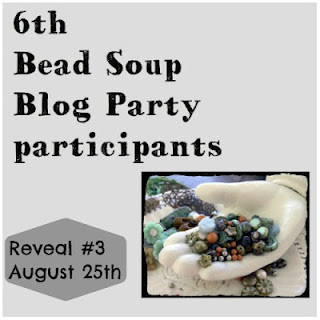 I have long been a fan of the "Bead Soup" blog-hops that Lori Anderson has hosted. Every time a new batch was being prepared, I had something that was keeping me away from my beading table. But when I saw the most recent sign-ups being posted for this summer's soup, I decided to tear down the obstacles blocking my creativity, and jump into the proverbial pot. My partner is another artist on the opposite side of the continent; Menka Gupta, the creative force behind Menka's Jewelry. Please visit her blog, or check out her Facebook page, and let her know Rachel sent you! More importantly, make sure to check back here for the big reveal on August 25, 2012, when both Menka and I will be unveiling the creations we design using each other's bead soup. Sounds like a long ways away, doesn't it? But we all know how time flows faster in summer, and there are two other groups doing reveal dates between now and then, so you will have plenty of eye candy to drool over between now and then. 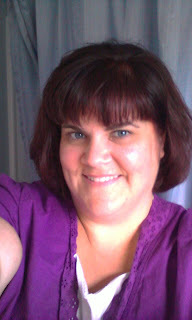 I have made the HUGE decision to re-name my business...to *my* name. Back when I started making jewelry and beads, I had such little confidence in myself, as a person and as an artist, that I was very hesitant to attach my name to my creations. Sad, isn't it? But that was many years, many lessons, and many creations ago, and I am ready to move forward, loudly proclaiming that I create. So, if you came here by way of "Handmade Chic" or "Inferno Glass Beads", you are simply dealing with the same person who kept herself hidden from view up until now. Visit My Website for Jewelry! Lampwork in my Etsy shop! Subscribe To R. Baron Designs! Teacher, writer, creator of pretty things.